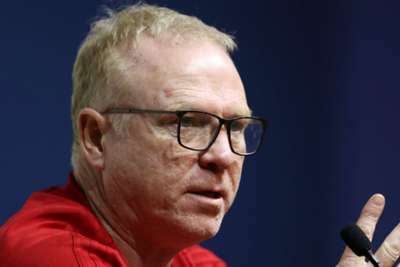 Alex McLeish refused to be drawn on speculation surrounding his future following Scotland's abject 3-0 defeat to Kazakhstan on Thursday. An inexperienced side were resoundingly beaten in their opening Euro 2020 qualifier in Astana as goals from Yuriy Pertsukh and Yan Vorogovskiy inside the first 10 minutes set the tone for a dismal outing. Baktiyor Zainutdinov added a third early in the second period to extinguish any lingering hope as McLeish's side were brought back down to earth with a bump following their Nations League promotion in November. Asked if such a disappointing result could lead to his dismissal, McLeish replied: "I'll just continue to do my job. Suffice to say I'm not going to get drawn into that question. "I don't really rank defeats. I just feel that in terms of losing, then I have to bounce back. I always feel low after a game but, as I said, I'm pretty good at bouncing back." Scotland's next Group I fixture comes in the form of a trip to minnows San Marino on Sunday, and McLeish demanded a response from his players, while ruing the absence of first-team regulars such as Liverpool full-back Andy Robertson. "Of course, it's never finished until it's finished. We bounced back from a poor performance in Israel [in the Nations League] and that's what we must do after this game," he said. "We have players with more experience that have to come back to the Scotland squad. Obviously, we need to have as strong a squad as we can if we're going to be successful in qualification. "We had a lot of young guys winning first caps and early caps. In terms of the goals, getting inside us was something that we actually emphasised to the players. We never saw it through in reality. "It could have been prevented with better positioning. The three finishes were pretty amazing but it was a poor night from us defensively and I say that as a team."